Tradeshow Displays by Ottawa Custom Signs offer an effective way of making your company get noticed and approached at any busy trade show. 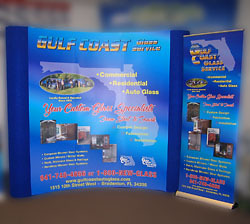 Our quality Tradeshow Displays project the professional image your customers expect. With dramatic graphics and photos, these high visibility displays are an exciting way to make your products, brands, or logos stand out from the crowd. All of our displays are built for ease of shipping and assembly, because the last thing you need to worry about at a trade show is your display. To make an enquiry about Tradeshow Displays please contact us now. To order a Tradeshow Display now please click here.